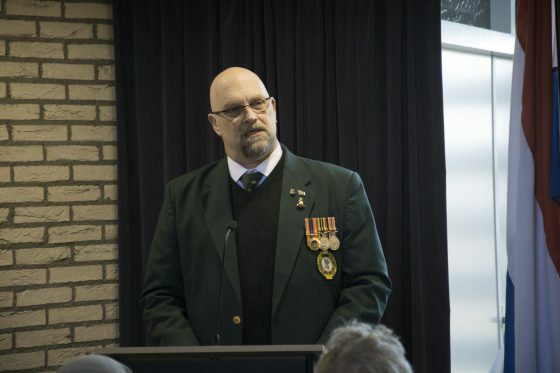 At 11 am on Wednesday February 21 2018, the South African Ambassador to The Hague, HE Vusi (Bruce) Koloane, His Worship The Mayor of Noordwijk, Alderman Jan Rypstra, under the guidance of programme director, Deputy-Mayor Gerben van Duin, joined with the ambassadors of several countries, and the military attachés of several more, and representatives of the South African Legion and other veterans, at the Commonwealth War Graves Commission section of the General Cemetery in Noordwijk in the Netherlands, on the 101st anniversary of the sinking of the SS Mendi*. 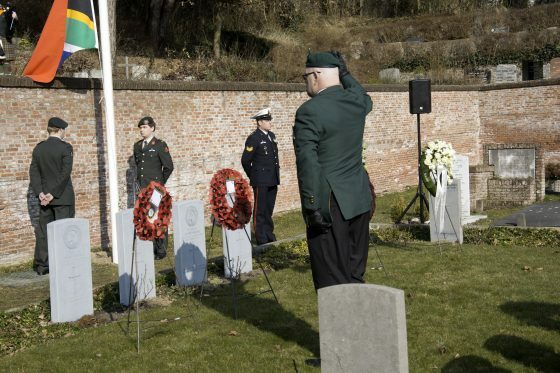 The Dutch Armed Forces provided a Guard of Honour, a brass band, and several pipers to add colour to a dignified event. Rev. 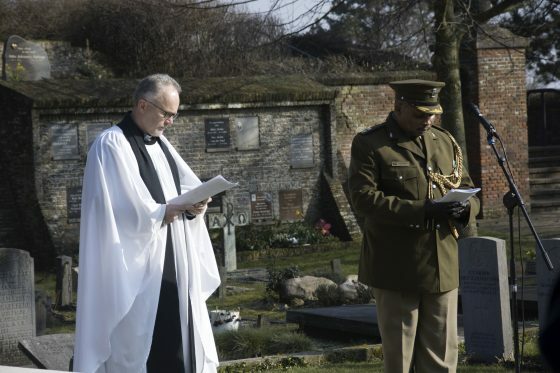 Andrew Gready led the service with hymns in the cemetery hall, before conducting the wreath-laying at the graveside. South African Deputy Military attaché, Lt Col Andrew Mafofololo orated the Act of Remembrance. 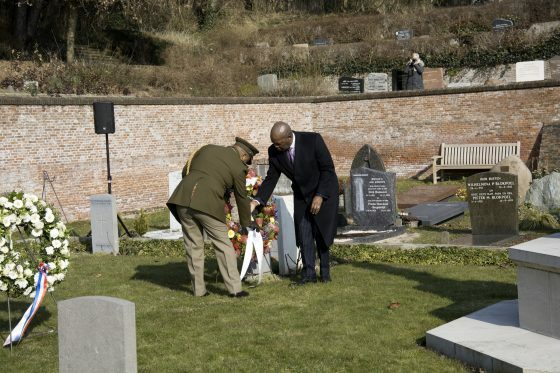 In his speech, the South African Ambassador to The Hague, HE Vusi (Bruce) Koloane specifically acknowledged the contribution of the SA Legion to “keeping the flame of remembrance for the SS Mendi alive“. 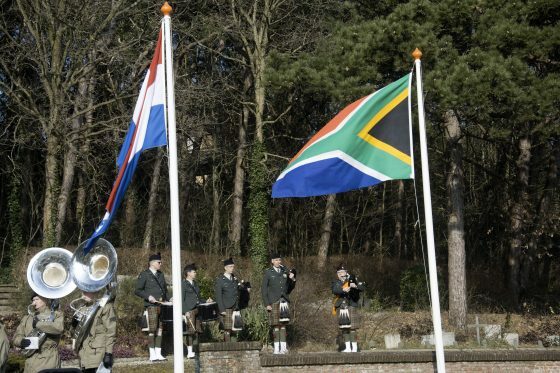 After the service, the South African Embassy hosted a delicious lunch of South African food and wine at the ultra-modern Noordwijk Sports Centre. * On 21 February 1917, the SS Mendi, a troop ship out of Cape Town carrying 823 men of the 5th Battalion South African Native Labour Corps bound for Le Havre in France was rammed by the Daro in thick fog in the English Channel of the Isle of Wight. They were travelling to support the war effort, in particular Britain and her allies, who were running out of people and supplies. The SS Mendi sank quickly with the loss of more than 600 South African servicemen. In 2012, February 21 was proclaimed as the day to observe Armed Forces Day annually. 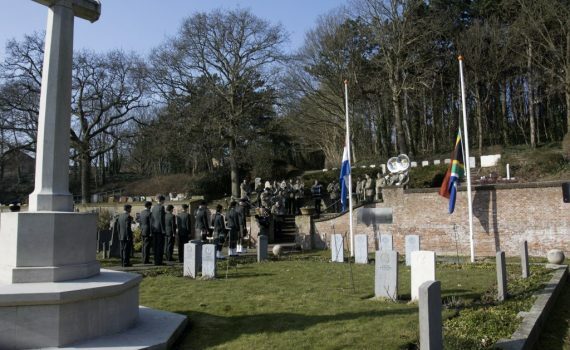 Since 2014, an annual remembrance and wreath-laying service has been held at the gravesides of Privates Sitebe Molife, Natal Kazimula, Abram Leboche, Arosi Zenzile, and Sikaniso Mtolo, who lie buried in the picturesque seaside town of Noordwijk in the Netherlands. They all perished when the SS Mendi sank, and their bodies were washed-up on the (neutral) Dutch coast.